Nguyen Thanh Phu is manager of the Mine Action Visitor Center, responsible for welcoming Vietnamese and foreign visitors and briefing them about the lingering impacts of the war. Phu explains the continuing threat, and current efforts by the Vietnamese government and military, and international NGOs, to address the UXO problem in Quang Tri Province. 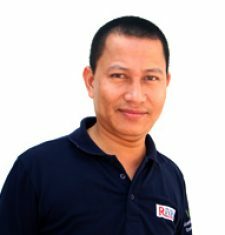 Phu is also in charge of Project RENEW’s Mine Risk Education program which provides UXO awareness and safe behavior guidance for children and adults. Phu has attended a number of professional training courses and workshops in Vietnam and abroad. Before joining Project RENEW in July 2010, Phu worked as a licensed English-speaking tour guide for nearly four years, so he has a vast knowledge of former battle fields, areas of military operations (AO), and other historical sites in and around the former Demilitarized Zone (DMZ). He holds a B.A degree in English.